The population of Oslo will increase in age in the coming years. As a result, the demand for public health services will increase and the municipality wants to give service users who want to live at home access to adequate health services. To prepare for this, the municipality’s healthcare services have started using technology. As the municipality gained more experience with the use of technology, they saw the potential to safeguard residents with cognitive challenges and dementia in a way that requires less manpower and at the same time giving the residents more freedom. This sparked the idea of Welhavens street 5. Welhavens street 5 is a municipal apartment building with 10 apartments. It has been renovated and tailor-made to fit the needs of older people experiencing cognitive decline. The residents receive home nursing from regular home care if needed. 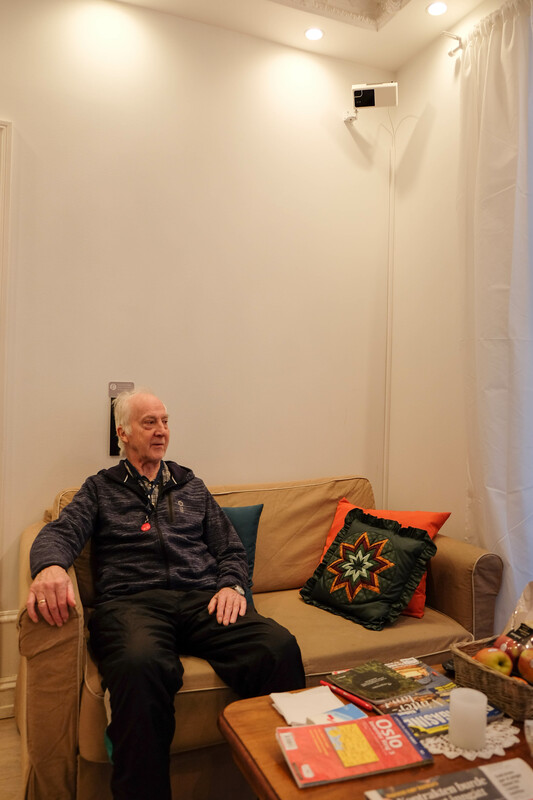 Technology such as sensors, anonymous cameras, GPS watches, automatic medicine dispensers and automatic voice instructions make sure that residents can have a more open environment than they would in a traditional home for older people experiencing cognitive decline. The residents are encouraged to keep their habits and continue doing activities that are meaningful to them. Our goal is to give them safety and stability with as little restriction as possible. Each resident has individually adapted service. It is now 2 years since Welhavens street 5 opened. Some residents have ended their lives there, and some have eventually been forced to move to a nursing home, yet all have had the opportunity to live independently for longer. How collaboration worked: Welhavens street 5 is funded by the municipality. The investment is made up for in a short time as the residents will not be needing to live in a nursing home. Welhavens street 5 is a cheap initiative compared with homes with more staff. The staff at Welhavens street 5 are mainly there to encourage activity and participation. The district has a team dedicated to welfare technology consisting of a doctor, occupational therapist, physical therapist, nurses and an IT resource. This team has been involved in the whole process making sure the technology is adapted to suit the individuals and that the service as a whole is proper. Details on older people's involvement: This is a service for older people. It is planned and executed based on experience with using technology in home care since 2013. We plan to build more homes like this, as we see how well this system works, and there is a demand for more than 10 apartments. The second building is scheduled to be ready in 2020. Other districts in the city are also adopting this model. Both towards use of technology in home care and housing of older people with cognitive challenges and dementia. We have learned that a service like this needs to be adaptable. There is no "one size fits all". We tried to generalize in the beginning, it was'nt until we adapted the service and the technology to the individuals that we really saw the effect. And this is ongoing to this day. The needs of the residents are ever changing. We also learned that the family can be a very good resource and we could profit by getting them involved even earlier. The biggest challenge was adapting to a different way of working. The staff at Welhavens street 5, including the night watchman and home care workers, all had to get used to the technology and use it in some way. A lot of information goes to the "alarm phone". This needs to be processed, but not everything requires action. We had many rounds of training, and this has been done in a number of ways. It is planned practical training with all new technologies. And we have hired a technical resource to handle problems and give training in specific situations. Training is an ongoing challenge. We also have rehearsals every once in a while if it is needed, but no matter how much training, it was when staff started seeing for themselves that using this technology actually was an easier and better way of working that it really started to work.